Holocaust survivor and Neve Tzuf resident Avigail Ben Nun speaks of the miracles, the hate, and her message to future generations. In an exclusive interview with Arutz Sheva, Holocaust survivor and Neve Tzuf resident Avigail Ben Nun speaks about the miracles in her life and how she sees Friday night's arson terror attack. "You can't compare it to what we went through during the war, like running for our lives, with nothing, just our clothes, and being saved is just a miracle," Ben Nun said. "I see miracles every day. Every day, I see my children, I see my grandchildren, I see my great-grandchildren. Every day is a miracle for me. And the house - we will build it again. And we'll build it even more beautiful." When asked how she feels about the fact that the fire was probably a terror attack, Ben Nun said, "It's not probably. It was....we saw the fire, the Molotov cocktail, thrown from a car passing...so it's hatred." She also says,there used to be no hatred between the Jews and Arabs, until "they brought in Arafat and his gangs...that's what started the education of the haters." Ben Nun said her message to her grandchildren is, "Just remember, everything is on paper, it is written, you should remember, you should talk about it, you should be together all the time and talk to each other and remind each other. That's all I ask." 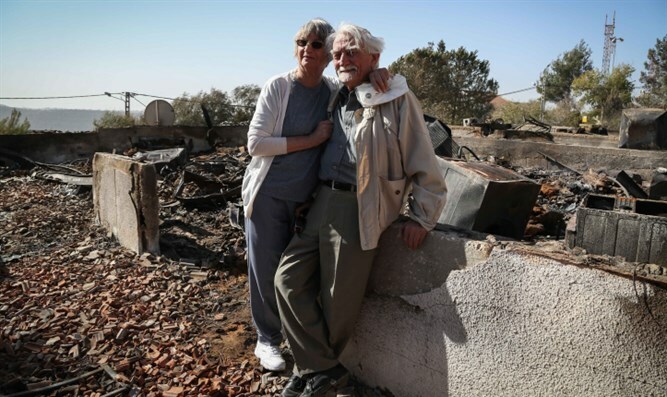 Earlier on Sunday morning, Arutz Sheva also interviewed Reserve Lieutenant Colonel and Neve Tzuf resident Itzik Shadmi, who said that for every house burnt down, Israel must build ten more.